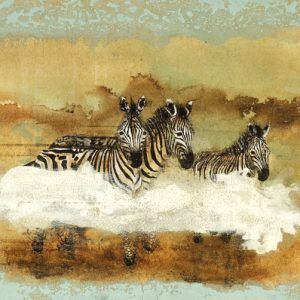 Jan Coutts is a New Zealander who moved to London to study art. She attended Camden Art School, St Martins College and the Royal College of Art and graduated in 1994. She has exhibited extensively since 1993 in places such as in London, Amsterdam, Glasgow & New York, producing many and varied commissioned works such as animal drawings for the Border Control Office at the Ngoro Ngoro Crater in Tanzania, an interior for Joseph in Chelsea and two 640ft long images spanning the Thames at Hungerford Bridge. 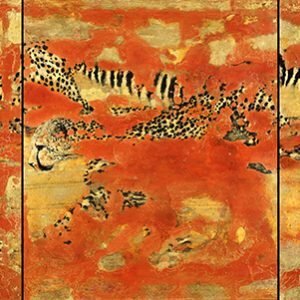 AJ Tipping, art critic, says of her African cheetah paintings " Against the silent metronome of evaporation, cracking, blistering, whitening the animals appeared as spectral flurries of speed and shimmering elegance, occasional explosions of life at its most intense were taking place." 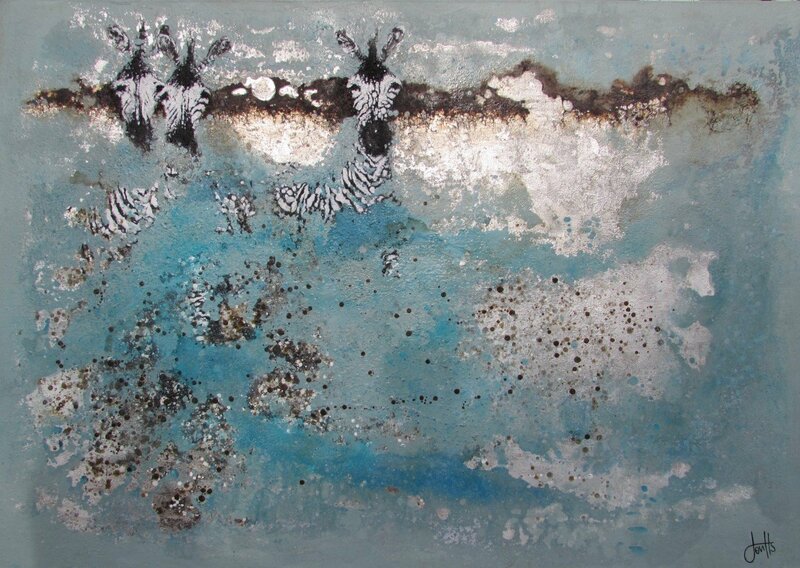 In the early 90's, Jan travelled to the Serengeti / Ngorongoro Conservation area, Tanzania and has been deeply inspired ever since. Her association with the continent of Africa now extends over numerous visits and many years. 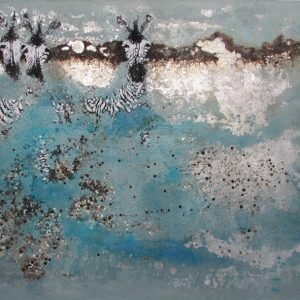 ... Viv Levy, MA RCA says of Jan's work: "We are privileged if we can witness a moment of the chase - without interfering or killing. Film capture these moments, it can speed them up, slow them down, stop them dead; the still camera seizes the split second and saves it forever. They record nature, they unveil mystery, they dissect movement, they stop time and they diffuse awe. 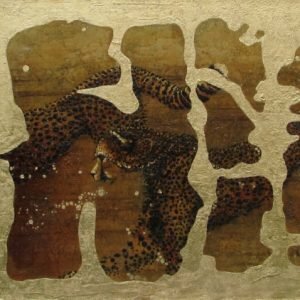 In Jan's paintings the beasts have not been tamed, they retain their dignity and their mystery, they are not hunted, nature is still operating and there is no final outcome. The tension between the materials used on these canvases works to compliment the movement of the subjects. Some of the images are almost entirely obscured, and yet we still sense rustling in the bush and are compelled to discover the source beating under layers of paint. 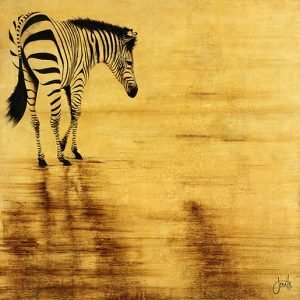 The beasts in these paintings are as elusive on canvas as they are in their natural habitat. 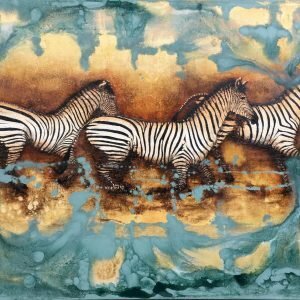 They reveal and camouflage themselves through patterns in the mists and shadows in the sun, they hunt and flee beneath layers of texture, their journeys are mapped by eroded patches of gold, silver and bronze leaf, their landscapes are cracked by layers of oil paint, glazes and resin as if they had been literally baked by the African sun."